They are classified as among the Myliobatiformes (which are stingrays and their relatives) and are placed in the Myliobatidae family (eagle rays). There are two species of Manta rays, birostris, which can reach up to 7m (23ft 0in) in width, and the much smaller M. alfredi, which can reach widths of up to 5.5m (18ft 1in). Both species of Manta ray are cartilaginous, and have large triangular pectoral fins, and possess large horn-shaped cephalic fins, with mouths that are located on the forward-facing side of their bodies. The large cephalic fins form a funnel-like structure which aids in feeding. While Manta rays are swimming, these fins are rolled into a spiral. Manta rays are found predominantly in tropical saltwater locations, although can also be found infrequently in subtropical and warm temperate salt waters. Both Manta species are pelagic, however alfredi tends to be a resident to coastal waters, while M. birostris migrates across the open oceans either singly, or in very large groups. Both species are also filter feeders, where they swallow large quantities of water in their mouths as they swim, ingesting large amounts of zooplankton, which are later filtered out from the water by their gill rakers. The gestation period in Mantas lasts for over a year, and they give birth to live pups. Mantas often visit cleaning stations, where they seek the aid of cleaner fish to remove parasites. Similar to whale behavior, they breach, however the reasons for this behavior is unknown. Both species are listed on the International Union for Conservation of Nature (IUCN) as vulnerable. This vulnerable status has come from a variety of anthropogenic threats including fishing net entanglement, pollution and hunting for harvesting their gill rakers as a use in traditional Chinese medicine. Their slow reproduction rates exacerbate these threats. They have a protected status in international waters, from the Convention on Migratory Species of Wild Animals (CMS), however they are far more vulnerable, the nearer to shore they are. Stingrays are small rays that are cartilaginous fish, which are more closely related to sharks. They belong to the suborder Myliobatoidei, of the order Myliobatiformes and consist of eight different families: Plesiobatidae (deepwater stingrays), Urotrygonidae (round rays), Hexatrygonidae (sixgill stingray), Urolophidae (stingarees), Dasyatidae (whiptail stingrays), Gymnuridae (butterfly rays), Potamotrygonidae (river stingrays), and Myliobatidae (eagle rays). The majority of stingrays have one or more stingers that are barbed (these are modified from dermal denticles) on their tails. These are exclusively used in self-defense. A stingray’s stinger can reach up to 35cm (14in) in length, and has two grooves on the underside which have venom glands. The entire stinger is covered in a thin skin layer, which is called the integumentary sheath. This is where the venom is concentrated. Some members of the suborder Myliobatoidei do not have stingers, such as the Manta rays and porcupine rays. Stingrays inhabit a variety of waters around the world, including tropical, subtropical and temperate waters. Some species are also found in freshwater locations. Some stingray species such as Plesiobatis daviesi are found in the deep ocean, while others such as Dasyatis thetidis are found in warm temperate oceans. Most Myliobatoids are considered demersal (meaning they inhabit the next-to-lowest zone within the water column). However, some, such as the eagle rays and pelagic stingray, are pelagic. There are currently 220 known species of stingrays that are organized into 10 families and 29 genera. Many stingray species are becoming progressively threatened and vulnerable to extinction, primarily due to unregulated fishing. In 2013, 45 species were listed as vulnerable or endangered by the IUCN. Both Manta rays and stingrays belong to the order Myliobatiformes. 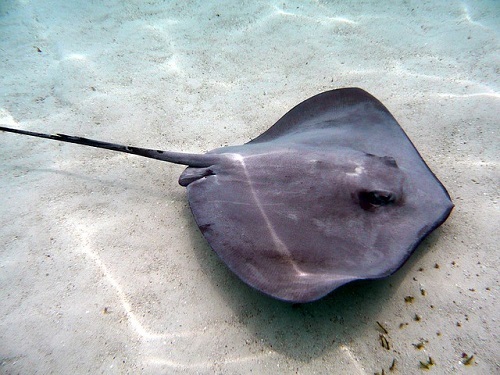 Both type of ray has a flattened body shape. Both type of ray are cartilaginous fish that are related to sharks. They both use gills as a means to take oxygen out of the water. Both rays have wide pectoral fins that are fused to the head. Both rays give birth to live young. What is the difference between Manta Rays and Stingrays? Tail Stinger: Manta rays do not possess a stinger or barb on the tail. Most stingrays on the other hand do possess a stinger or barb on the tail. Habitat: Manta rays live predominantly in tropical and subtropical salt waters, while stingrays can also be found in warm temperate waters, as well as some species living in freshwater habitats. Mouth location: The mouth of a Manta ray is located on the front, forward facing edge of the body, while the mouth of a stingray is located on the underside of its body. Size: Manta rays are much larger is size, and are proportionately much wider than they are long. Stingrays on the other hand, are generally much smaller in size and are proportionately much longer in length than they are wide. 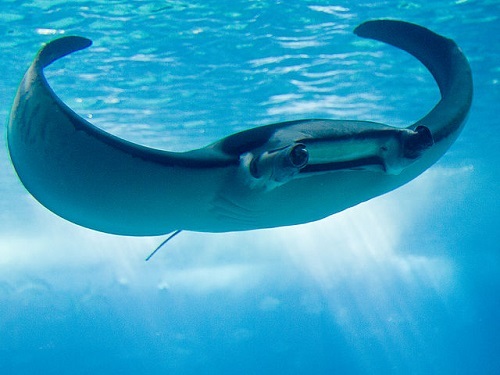 Cephalic fins: Manta rays possess a pair of cephalic ‘horn like’ fins on its head, however stingrays do not have these, instead having just a continuous rounded head. Visitations to cleaning stations: Manta rays frequently visit cleaning stations in order to get their gills cleaned, and their parasites removed by cleaner fish. However, most stingrays do not visit cleaning stations. Diet: Manta rays are filter feeders, that feed exclusively on Zooplankton in the water column, while stingrays are bottom feeders that eat various different species of crustaceans and mollusks. Size Very large in size reaching up 7m in width. Is proportionately larger in width than it is length. Relatively small in size, typically reaching up to 2m in length. Is proportionately larger in length than it is width. Both Manta rays and Stingrays are rays that belong to the order Myliobatiformes (Stingrays and their relatives). They are both cartilaginous fish that are related to sharks, with a number of species of both Manta rays and Stingrays being classed as vulnerable or endangered, as a result of unregulated fishing, hunting and pollution. Both share a number of similarities, including their flattened body shape and composition, as well as both giving birth to live young and having wide pectoral fins that are fused to the head. The primary difference between a Manta ray and a Stingray is the presence or absence of a stinger. Manta rays do not have a stinger or barb on their tail, while most Stingrays do. The second most significant difference is the size of each ray. Manta rays are significantly bigger, where they are proportionately much wider than they are long. Stingrays, conversely, are much smaller in size and are proportionally much longer than they are wide. Other notable differences include their diet, the presence of cephalic fins, mouth location and their place of residence within the water column. Alexander Hammond. "Difference between Manta Ray and Stingray." DifferenceBetween.net. October 17, 2017 < http://www.differencebetween.net/science/nature/animals-nature/difference-between-manta-ray-and-stingray/ >. Dulvy, Nicholas K. et al. “You Can Swim but You Can’t Hide: The Global Status and Conservation of Oceanic Pelagic Sharks and Rays.” Aquatic Conservation: Marine and Freshwater Ecosystems 18.5 (2008): 459–482. Web. 9 Oct. 2017. Michael, Scott W. Reef Sharks & Rays of the World. Prostar Pubns, 2005. Web. 9 Oct. 2017. Urry, L. A. et al. Campbell Biology. 11th ed. Pearson, 2017. Print.